Jack Crawford’s line, “God, Satan and the Great Red Dragon” is the essential summary of this final half of Hannibal; Jack is even kind enough to spell it out for us. In this twisted version of events, Jack is God, Hannibal is Satan and the Dragon is exactly that. As far as episodes of Hannibal go, this was somehow more savage than many that came before – Digestivo’ was gory, as were any number of past episodes but they didn’t feature the kind of bestial savagery that this episode, ‘The Number of the Beast is 666’. This episode is Armitage’s to command – both Will and Hannibal have had their time in the spotlight but now it is the Dragon’s turn to dominate the main stage. The performance Armitage puts up in nothing short of stellar; I have mentioned time and time again that Armitage has really captured the terror of the Great Red Dragon, but this week we see that terror in a completely new light. This penultimate episode also shatters some illusions that the characters have had for far too long; none of them are really in charge of what is going on here. Hannibal has controlled events from behind the scenes almost since the beginning and Will has been his agent just as much as Dolarhyde, but with the season finale approaching, it just might be time for the Lamb to get even with the monster that has plagued it for so very long. For we get there though, just us mourn the character of Frederick Chilton. Yes, he is very much alive, but his part in this nightmare has ended. Chilton’s character was never one that we could take too seriously – he was never anything more than an inconvenience; an annoyance that protagonists and antagonists had to work their way around. Of course, there were moments in past seasons where brushing him off took more effort that we had been led to believe but Chilton has never been in the driving seat at any point. He was misled and used and ridiculed by nearly every character at various points and his questionable ethical and moral positions have ensured that it wasn’t until he was shot in the face that he began earning even the slightest bits of sympathy from the audience. 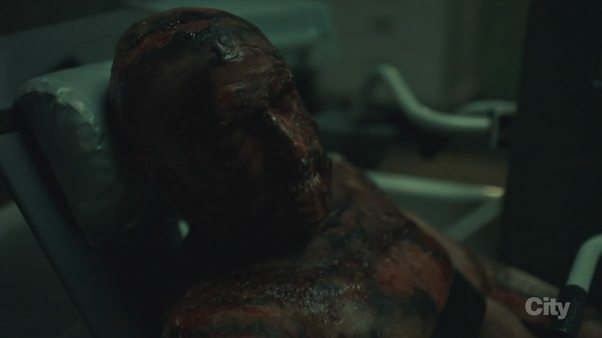 Still, I’m sure we can all agree that as slimy and disgusting a person as he was, he did not really deserve to have his lips bitten off and his body set on fire. If nothing else, Chilton’s death was an ominous sign for what awaits Will in the next episode, though I, for one, would be extremely surprised if Will doesn’t in some sense emerge triumphant from this mess. With the series finale next week then, let’s not spend too much discussing what the characters are and are not thinking – if next week doesn’t lay it all bare then we can speculate away after that. Instead, for now, let’s focus on where this is all going and what plot points the finale needs to address. Let’s begin with Hannibal himself – it seems that there are only two ways for this story to end; Hannibal alive and free or dead at the hands of Will Graham. There is a third option – that Hannibal remains in his cell and in some ways, that option feels right to me but it would make for an unsatisfactory ending. After all, Hannibal did promise that he would kill Alana and there is no way that will happen if he stays in his cell. Alana herself seems destined to end up in Hannibal’s stomach but whether she will be able to put up a fight before that happens, remains to be seen. There is a solid chance that Jack Crawford makes it through all this but no matter what happens, it seems that he is destined to be haunted by his actions for the rest of his life. If Will does finally snap and go on the mini-rampage that next week’s episode’s title implies, then Jack will have no one to blame for it but himself and Hannibal. If Will does perish, either to Dolarhyde or to Hannibal, that death will haunt Jack though, strangely enough, I think he might see it as a cleaner end than the alternative. The question though, is where that leaves the Dragon himself. 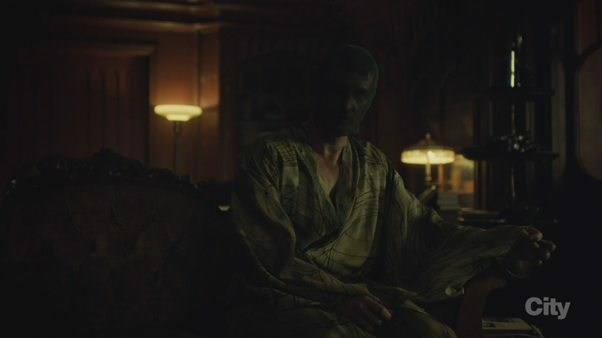 Dolarhyde is a menace and after watching him take out Chilton, most bets seem to be off but at the same time, he is simply not a big enough threat (from a narrative standpoint) to emerge from the series’ finale victorious. He will have his transformation, that much is certain, but whether he and his final victims will survive it remains to be seen.